For Danish version of this page, please click HERE! Click HERE for gamelan music from Bali! Indonesia is much more than Bali. Click HERE to check out one of my other illustrated web-pages about this marvellous country! Beyond any competition, Bali is the most visited place in the Indonesian archipelago. To many westerners, the island represents the dream of the tropical paradise with palm beaches, rice fields, handsome people and a harmonic, simple life style. During the last decades, Bali has been overcrowded by hordes of tourists, who have primarily come in order to fulfil this dream. However, I am sure that most of them has got a mental chock after the landing in Kuta International Airport. When they leave the airport they find themselves in the middle of one of the world's major tourist centres. The area around the airport is covered with tourist hotels of all categories, the traffic is overwhelming, and the numerous advertising plates contribute to the destruction of the expectation of Paradise. Bali is often called "The Australian Mallorca", and frankly, that comparison is not so bad at all. At many places in the southern part of the island, the degree of tourism is at least as high as Mallorca and Costa del Sol. In spite of that, I consider Bali as a "must" for first time visitors to Indonesia. The culture is beautiful and exciting, and it's surprisingly unspoiled by the heavy tourism. Leave Kuta and Den Pasar behind, and you will find many of the things you were dreaming of, but you have search a little for them. <= Click on the map to zoom out! I have been travelling a lot all over Indonesia, and I have visited Bali several times. In the following, I would like to suggest some good things to see and do for first time travellers to this island, hoping that this may give them some good experiences. Most off the suggestions are based on my personal experience, so they may be a little casual and alternative. The Indonesians are very friendly and hospitable, and they are one of the main reasons for the great attraction of the country. As a westerner, you feel welcome almost everywhere. 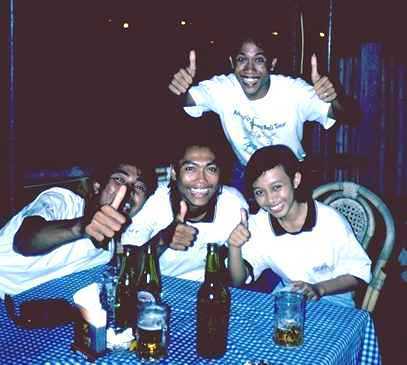 This photo is from the tourist Mekka in Kuta, where I spent a whole night talking with these young Balinesians. And finally: Indonesia is a marvellous country! When you have been to Bali, you should go back and visit some of the other islands. The people are friendly and hospitable, and the country itself has a countless number of strong cultures and religions. 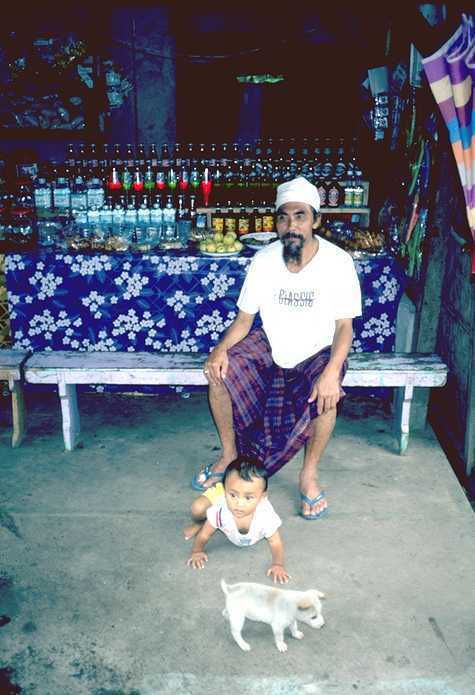 Bali itself has a unique culture and religion mainly based on Hinduism, but most Indonesians are Moslems. However, it's a mild form of Islam, very different from the way it's practised in the Moslem countries of the Middle East. And as a tourist, you feel welcome almost everywhere in a nice and relaxed way. You may read more about my travels to some of the other islands by using the links at the bottom of this page. Try a visit to the town Ubud in the central highlands. The soul of Bali is told to be found somewhere in the hills around Ubud. You won't get rid of tourists here either, but the landscape is beautiful and there are plenty of things to do. Rent a bicycle or a motor-bike and take a ride on the small roads between the rice-fields. 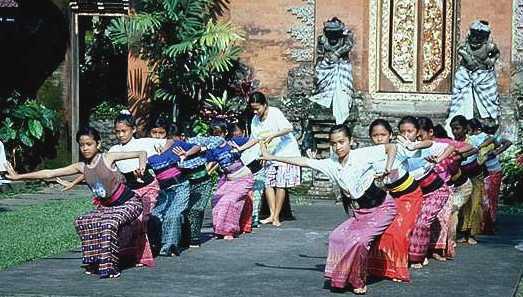 Young Balinese dancers from a dancing school are practising outside the royal palace in Ubud. Every night, there is a performance of Balinese dancing at this place. In the real performance at night, the music is played by a genuine gamelan orchestra, and the dancers are wearing the colourful, traditional clothing. The dances are derived from ancient legends and myths. Or you may take a walk in the hills around the town. Ask for "Bali Pathfinder", which is the name of a small map and a pamphlet with good suggestions for treks around Ubud. The landscape is green and fertile. If you like art and handicraft, you will find an abundance of paintings, batik and woodcarving everywhere, produced in the surrounding villages. Every night, there is a performance of Balinese dancing with traditional gamelan music at the royal palace in the town centre. If you like exotic food, Ubud is a good place too, with plenty of excellent restaurants. Above, left: Ubud and the hill country around the town is the cultural centre of Bali. The best way to explore the beautiful landscape is to hire a bicycle or a motor-bike or make some walks along the small paths between the rice fields. Above, right: Everywhere along the roads of Bali you find small "general shops" like this, sheltered by a small open shed. The selection is limited, but you may buy soft drinks, biscuits, fruits, nuts, etc. - or get a conversation with the owner. When visiting Ubud, don't just do it on an arranged excursion, with just a few hours' visit. Instead, you should find a guest-house or home stay and stay there for some days. There are plenty of small places with nice rooms at reasonable prices. <== Click for max size! On Bali like everywhere in Indonesia you will find nice, small and cheap guest-houses - ideal places to relax and find yourself. This photo is from Ketut's Place in Ubud. I have stayed at several guest-houses in Ubud, but on my last visit, I stayed at Ketut's Place in the outskirts of the town. 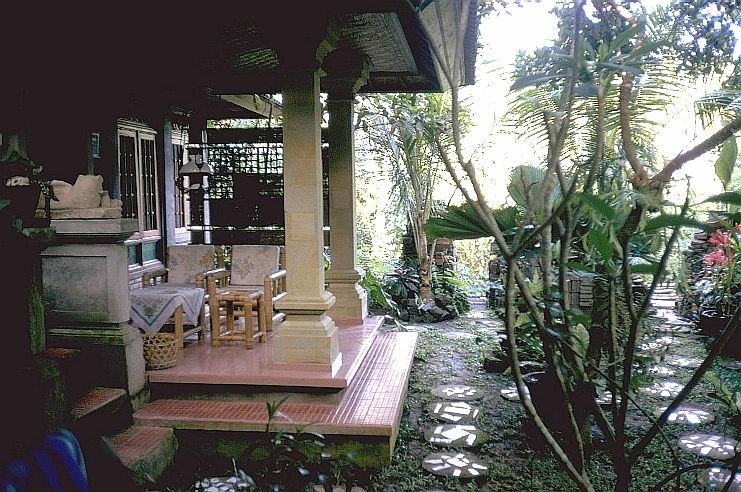 The house itself is a traditional Balinese home - a nice and exciting place, run by a Balinese family. A couple of times a week, you may enjoy a traditional Balinese banquet, consisting of 10-14 dishes. If you like trekking, you should try to climb the volcano Gunung Batur (1.717 meters). It's a nice and impressive trip, within the reach of most people in general good physical form. There are different routes leading to the top, but most trekkers start from Lake Batur in the highlands, and the climb itself takes a couple of hours. Guided treks are arranged from Ubud, from where you are taken to Lake Batur by car and stay overnight there at a small guest-house. Early next morning you start climbing, reaching the summit at sunrise. But of cause, you may got to the lake area yourself and stay there for a couple of days. The area around Tirta Gangga on eastern Bali are one of the less known places. 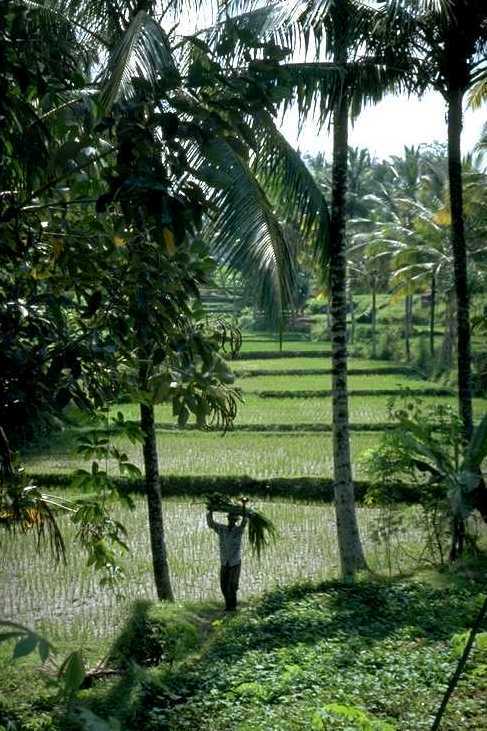 The area is peaceful and relaxed, and the rice fields are some of the most picturesque of the island. There are picturesque rice fields everywhere on Bali, but some of the most impressive of them are found around the small village of Tirta Gangga on eastern Bali. The area is quiet and relaxed, and you can make good walks in the surroundings and stay at some small, cheap guest-houses. On the southernmost tip of Bali, you find the Bukit peninsula as a small appendix. It's quite close to Kuta and the airport, and the southern coast of this peninsula is absolutely worth visiting. The land drops steeply into the sea at most places, and there are quite a few temples along the coast. Ulu Watu is one of the most well-known of these - mostly because of its position op top of steep cliffs. The beaches close to the temple (especially Pantai Suluban) are some of Balis most well-known surfing areas. Another impressive place at the coast is Nyang Nyang, with an excellent beach at the foot of about 100 meter high, almost vertical cliffs. As a contrast to Kuta and Sanur, it's very peaceful out there. If you want to see more photos from Bali, then take a closer look at the small selection below. And click on the thumbnails for max size. Above, left: The Balinese culture is surprisingly unspoilt by the tremendous number of tourist visiting the island. Above, middle: Balinese family near the village of Tirtagangga, eastern Bali. They invited me to stay in their home for a while, and they showed me some incredible ceremonies around the Balinese new year. 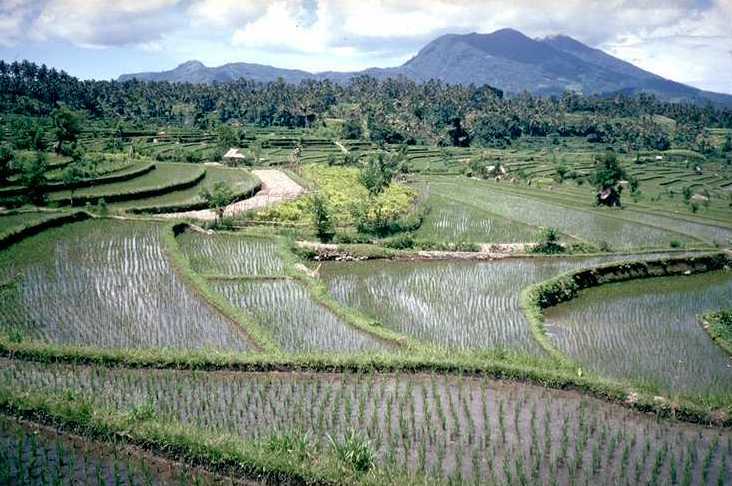 Above, right: Rice fields in the early morning near Tirta Gangga on eastern Bali. If you have any comments or questions for me, please mail me on pontoppidan214@gmail.com .